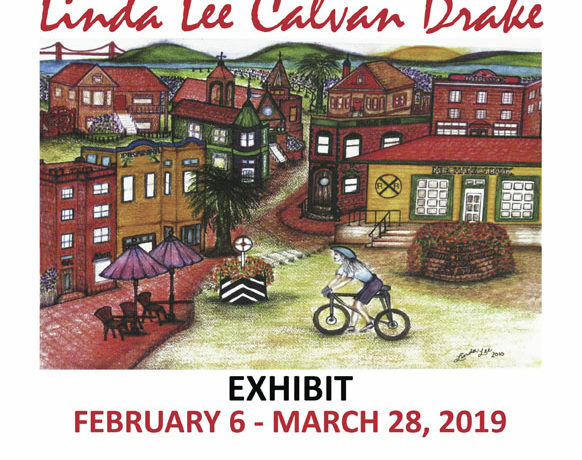 Artist and mentor, Linda Drake served as President of Arts of Point Richmond from 2010 until her passing in 2013. 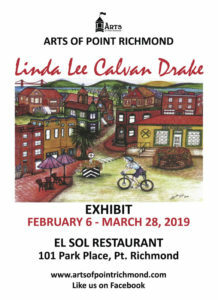 This exhibition includes some of the works in her charming series “Vintage Views of Old Point Richmond Town.” Arts of Point Richmond is partnering with Linda’s sister Josephine Orozco (proprietor of El Sol) and to inaugurate El Sol as the Linda Lee Calvan Drake Memorial Gallery. It will continue to feature artwork by AOPR members. To better showcase art, a professional hanging system has been installed, funded by Arts of Point Richmond and a grant from Gateway Foundation.